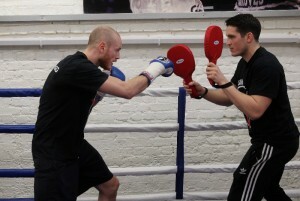 Ring News 24Boxing NewsIs It The End Of The Road For George Groves? George ‘The Saint’ Groves will have to think long and hard about where his standing in boxing is from here on out after his dramatic 7th round KO loss to Liverpool’s Callum Smith in the World Boxing Super Series final. The fight took place in Saudi Arabia. Smith was able to use his height and reach to full advantage, smacking Groves with mainly right hands that sent the Hammersmith boxer reeling throughout the contest. But it was a counter left hand in the 7th that had Groves rocking back into a corner. He attempted to cover up, however, follow up punches, which included an uppercut, sent Groves down on one knee. The champion elected not to continue and instead took the full ten-second count. Smith was then crowned the WBA Super champion as well as the new holder of the Ring Magazine and WBC Diamond belts. Callum will now likely be considered to be the main man of the super-middleweight division after Friday night’s clash although there appears to be a lack of more big names for him to fight. Standing at 6’3, perhaps he may move up a division to seek new challenges. 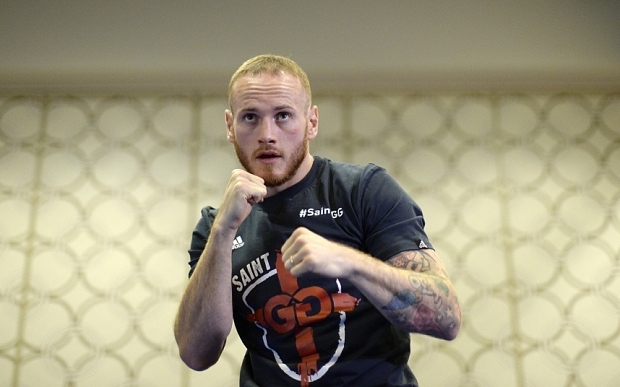 But the man who will have substantially more to consider is George Groves. At age just 30, he is still quite young but he has already been involved in his fair share of taxing bouts. His first fight with Carl Froch was a slugfest at times and the knockout he suffered in the 2014 rematch looked devastating enough that it could have permanently ended his career. Groves decided to carry on and he faced another setback to Badou Jack for the WBC super-middleweight title in 2015. Ever determined, ‘The Saint’ marched forward in defiance but he looked as if he had lost a step. He looked more vulnerable than ever before, even having trouble with the smaller Martin Murray before taking a unanimous decision. 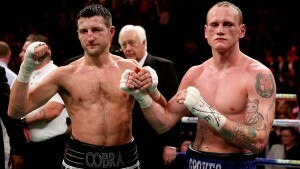 Groves was involved in two taxing fights with Carl Froch. But in 2017, Groves’ time came when he stopped Fedor Chudinov in 6 for the WBA super-middleweight title and his mission to become champion of the world was finally accomplished! 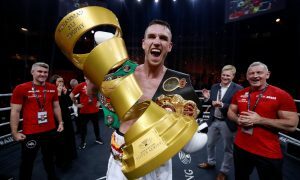 He had no hesitation in entering the World Boxing Super Series soon after, and a quick win over Jamie Cox setup a mega domestic bout with Chris Eubank Jr. The fight divided predictions in regards to who would win and lose. Groves actually ended up winning quite comfortably on points, although he suffered a dislocated shoulder in the final round that saw him out of the ring for seven months. There is no doubt that Groves’ career has been turbulent during the last five years, but this is what can happen when you eventually compete at world level. Although he never made any excuse for his loss to Smith, you have to wonder whether the shoulder dislocation has actually been given adequate time to fully heal. And does George really want to get back in line again and work his way back for another title opportunity? He could be in store for some repetition for some time to come if he chooses to do so. Will Groves go back to the drawing board or retire? Alternatively, a rematch with rival James DeGale might still be on the table. DeGale vacated the IBF title that he won back from Caleb Truax after their original encounter saw the Englishman suffer a shocking loss. He was supposed to be taking an 8 round stay busy bout this weekend so he could keep the ring rust off in preparation to face a big name. But if that does not come off then might the public want to see a return between the pair? Their first fight in 2011 was hardly an epic classic but bad blood still exists between the two. The bottom line is, that sadly for George, it seems that his options are rather limited at this point and it would not be surprising if he decided to call it a day. He has achieved almost everything he set out to do. And not many fighters can say that.